To start, we’re going to blend together our quick-and-easy marinade for the tuna steaks. 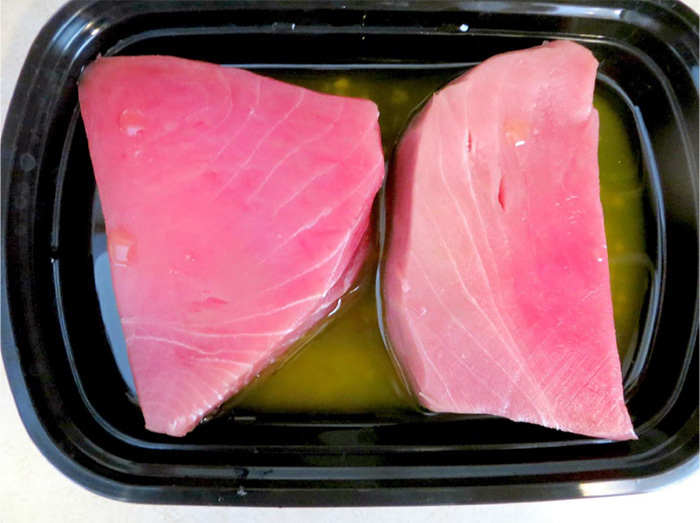 In a shallow dish large enough to hold both tuna steaks, blend together ¼ cup olive oil, ½ tsp. minced garlic, and 2 Tbsp. Lime juice. Whisk until combined. Lay the tuna steaks into the marinade, taking care to coat both sides well. Cover and refrigerate for at least 30 minutes. 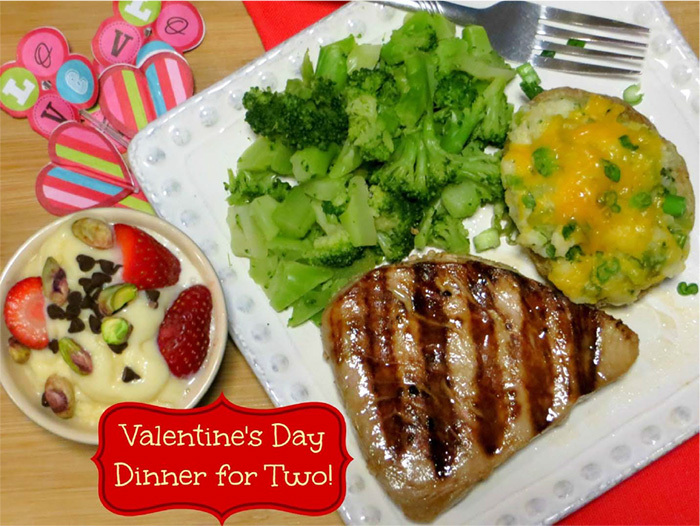 While your tuna is marinating, you should definitely make this Twice Baked Cheddar Broccoli baked potato (that’s so easy and is delicious when paired with these tuna steaks). They’ll be finished and ready to go just in time for your steaks! Once your steaks are done marinating, sprinkle with the remaining teaspoon of lime juice and a few dashes of pepper then toss on a table top grill (like a George Foreman®) that has been heated. Grill for 5-7 minutes until the tuna reaches your desired doneness. Voila! Dinner is done! Did you blink? If you did, you definitely missed the cooking process J. See, super fancy but totally easy. But, no fancy dinner is complete without a fancy dessert. 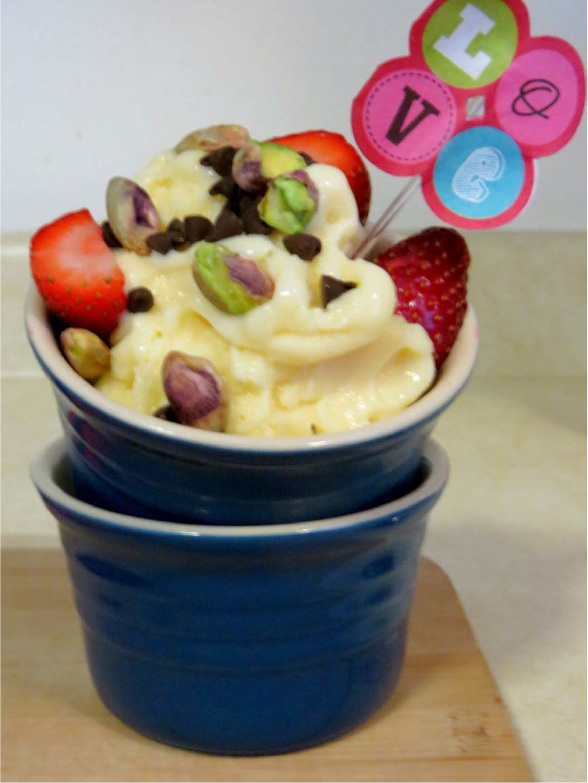 One of my favorite dessert options is fro-yo, but I’m definitely not going out to a self-serve yogurt bar after my dinner in, so, to remedy the situation I made one at home. 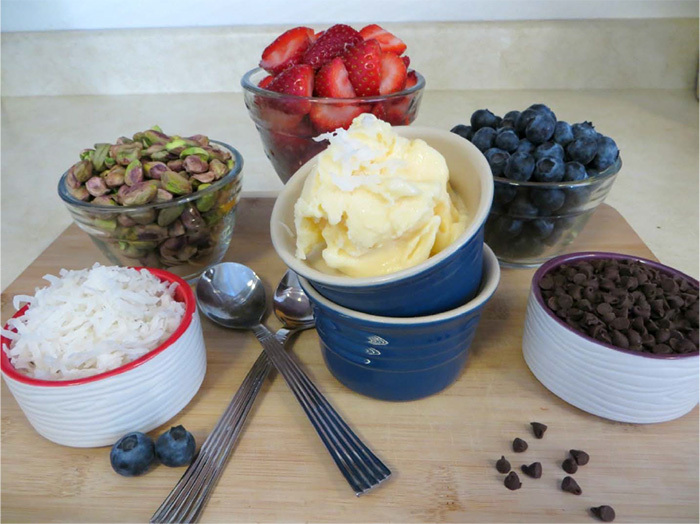 Simply dollop out a couple scoops of Frozen Yogurt (this one is my favorite by far) and assemble several of your favorite toppings, self-serve style! All the best parts of a fro-yo bar without the cost, lines, or wait. I hope you have a love-filled week; Happy Valentine’s Day from me to you! 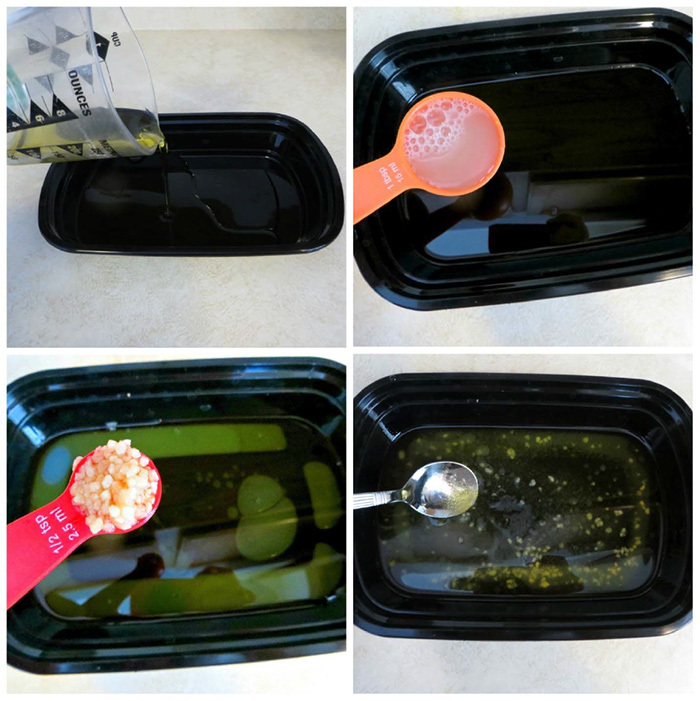 Combine olive oil, garlic, and 2 Tbsp. lime juice to make a marinade. Add tuna steaks to the marinade and toss around to coat them. Cover and place in the fridge for 30 minutes. 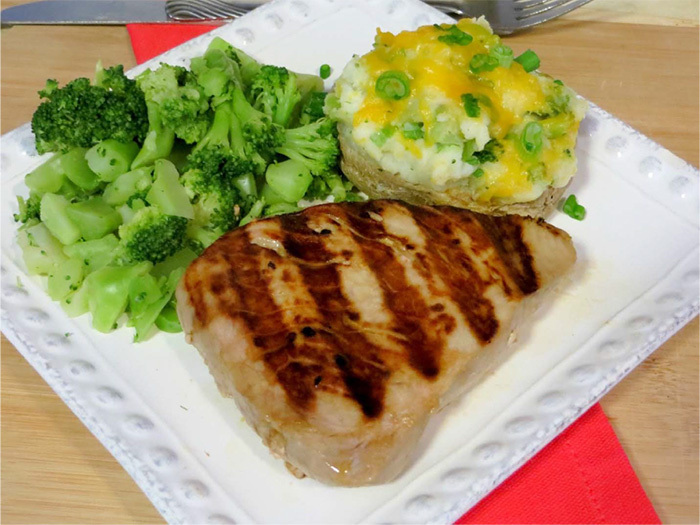 Remove tuna steaks from marinade and lightly coat with additional 1 tsp. lime juice, and season generously with pepper on both sides. Heat countertop grill (such as a George Foreman® Grill) as hot as possible. 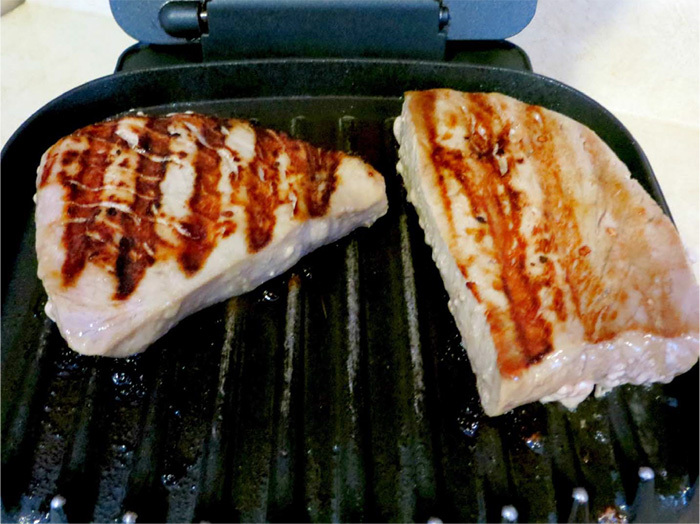 Once preheated, add tuna steaks and close grill lid. Cook for approximately 5-7 minutes, or until the tuna reaches an internal temperature of 145°F. Per Steak*: Calories 370, Total Fat 15g (Saturated 2.5g, Trans 0g), Cholesterol 90mg, Sodium 105mg, Total Carbohydrate 2g (Dietary Fiber 0g, Sugars 0g), Protein 55g, Vitamin A 2%, Vitamin C 2%, Calcium 2%, Iron 10% *Nutritional values are an approximation. Actual nutritional values may vary due to preparation techniques, variations related to suppliers, regional and seasonal differences, or rounding. Jenny Dahl is a Registered Dietitian Nutritionist (RDN) with Festival Foods and is certified by the state of WI.